FMAS has many areas for volunteers. Depending on your experience and interests we can match you with the tasks that best suits you and the animals. Council potential adopters to make sure they get an animal that fits their lifesyle. Work with our higest need animals on manners, socialization or basic obedience. This is essential in making dogs and cats more adoptable. Ensure MCAS Dogs get the exercise they need and deserve every day. Participate in oce a month trips to various Bay Area PetsMart stores to assist in adoption events. Provide temporary care for animals in your home until they can be adopted or go to rescue. Transport animals from MCAS to recues in California, Oregon and Washington. Also occasional transport single animals for rescue, adoption or vet care. Help with filing and data entry is needed. Help with various hand-person projects and maintenance around the MCAS Facility. and someone will contact you with additional information . Foster care and volunteer training is provided for anyone interested in becoming a volunteer. Foster parents provide temporary care for cats, kittens, dogs and puppies in their own Madera County and greater-Madera area homes. Some animals need as little as two weeks of care, while others may need care for up to three months. Fostering is flexible enough for most lifestyles and FMAS will custom-match the animals to each foster home. By offering your time, energy and home to an animal in need, you prepare the animal for adoption into a permanent home as well as help prevent overcrowding in our shelter. FMAS is always looking for more foster homes, especially throughout the busy spring and summer seasons. They are too young to be spayed or neutered and adopted out into permanent homes. When kittens and puppies are eight weeks old and weigh at least two pounds, they can be spayed or neutered and made available for adoption. They are nursing a litter of kittens or puppies. Although the shelter is a safe environment, it is not the best for raising babies. FMAS provides: All veterinary care and medicine for foster animals, plus plenty of support to foster parent volunteers. Foster parent volunteers provide: Time and a place in their home and lots of love. 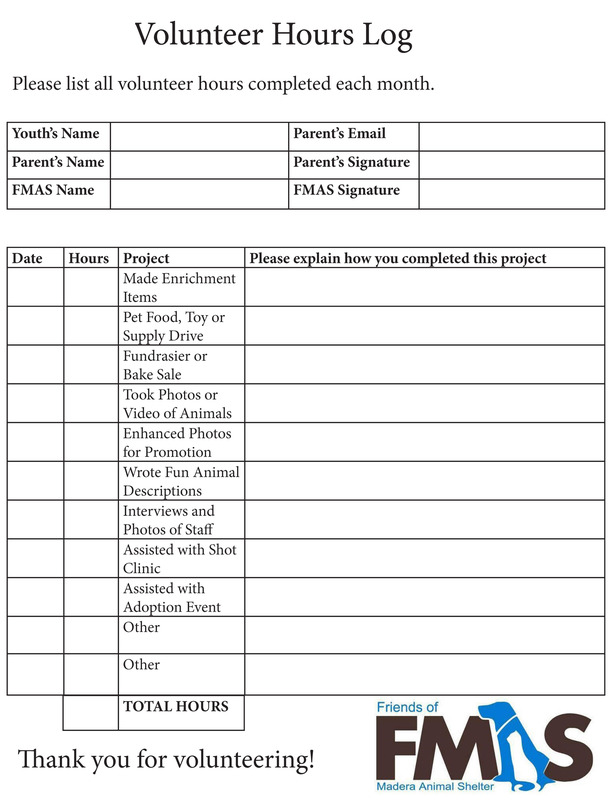 FMAS would love to have you as a volunteer. We cannot do what we do without dedicated and hardworking compasionate volunteers. If you are interested in volunteering with our organazation please complete an application and email it in or contact us on the form submission and someone will contact you with the necesarry information to get you started. We also have youth volunteer opportunities as well forvolunteers under the age of 18. FMAS is always in need of fosters. One of those fostering needs is bottle babies and moms and kittens. Especially during kitten season we have a great need for fosters for cats and kittens. Please download our application and email or mail it in. You can also come in person and fill one out. Please call 559-363-5106 for more information. Attached is our volunteer handbook. Feel free to download this for reference. You can always contact us with any questions or concerns you have regarding volunteering. Here is a helpful video on how to safely bottle feed your foster kittens. Here is a helpful video for those of you who may be having some problems with bottle babies. All kittens are different and some tend to be a little more challenging.